Although primarily developed to reduce light when it is too bright, this is not the only feature of this fantastic filter from Hama. As well as having the ability to control the light going into the picture by lengthening the exposure time between +1 and +8 aperture stops, it also allows the photographer to use large apertures while taking pictures outside backround gets hazy. This will create an overall clearer, sharper image, with a higher quality more professional appearance. Furthermore, by covering the lens it gives added protection against grime, dust, fingerprints and scratches that can cause the quality of images to otherwise significantly deteriorate. The protection of your camera lens can also help to increase the resale price of your camera when the time comes for an upgrade, because your lens is still in mint condition. 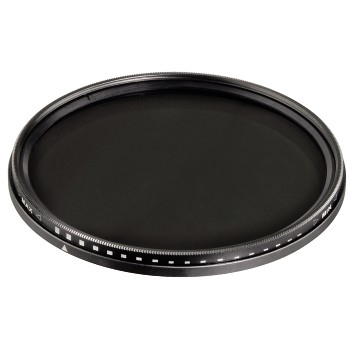 The Variable ND Filter 49 mm has rotatable front lens so you really can get that perfect precision picture everytime and in case of exposure times longer than 1/30 seconds, water ""flows"" (if they are shorter, it freezes to ice). At such good value for money and with such a huge improvement in image quality, whether you are an amateur or a professional, you will wonder what you ever did without it. Protect your lens with Hama today! - Due to long exposure times flowing water gets "soft"